The Jury awarded one special prize to CQGL (Conseil québecois des gais et lesbiennes), for the content of their message sent to spectators: huge posters showing public personalities which gave homphobic comments. Does the present reflect the upcomng future? 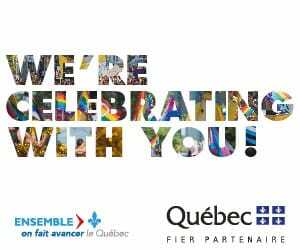 The Jury awarded one special prize to Tourisme Montréal (Queer of the Year), to underline their long term dedication to the Montréal LGBT community for making us shine around the world. The Organizing Committee gave its “coup de coeur”, for a very festive and animated participation, to the Montréal Youth Coalition Against Homophobia. The Jury awarded one special prize for fabulous costumes to Chromatica (les Nymphes), and the Organasing Committee gave its “coup de coeur” to Complexe Sky. The Jury awarded two special prizes for make up, given to the Lionne of Cabaret Mado, and for costume, to the girafes of Le Dôm-ms Académie. The jury also awarded a Special Jury Prize to “À pied levé”, a local aerobics team.